In February 2012, Honolulu Rail Transit received approval from the Federal Transportation Administration (FTA) to move forward with the next phase of construction. This means work on foundations, columns, a maintenance and storage facility, and stations in Waipahu. This month, utilities are being relocated and soil-samples are being taken along Farrington Highway; pre-engineering crews are working along Kamehameha Highway for the second section of the transit route; and archeological survey work will resume in urban Honolulu. But public support seems to be waning. Opinion polls reveal that 53% (Honolulu Star-Advertiser) or 55% (Civil Beat) of likely voters on Oahu oppose rail. 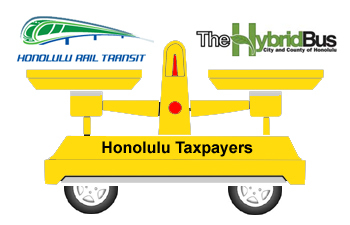 Meanwhile, the House Budget Committee proposed a 36% cut to the Highway Trust Fund last month – which could affect federal funding of Honolulu Rail. And HonoluluTraffic.com’s legal action against the FTA and the city of Honolulu is still in progress. 1. Build more TheBus park-and-ride facilities. There are currently only five park-and-ride facilities, in Hawaii Kai, Mililani, Royal Kunia, Wahiawa, and Haleiwa. We could build more parking facilities near bus routes, which would encourage bus ridership. 2. Integrate public school buses with public bus service. The Hawaii Department of Education is requesting $42 million for school bus service for the 2012-2013 school year, but may have to eliminate school bus service on Oahu entirely because of budget cut-backs. The city of Honolulu has already stated that it cannot expand its service to accommodate students. One alternative is to add more city buses before and after school, with special routes that stop at public schools. 3. Install more electric charging stations for hybrid buses. TheBus has 60 hybrid buses (11% of the fleet) and has purchased 19 more hybrid buses. Hawaii’s EV Ready Program will install 120 charging stations at 100 stations around the state. But we need charging stations for buses too. 4. Add “Special Event” bus routes. Five Oahu venues could really benefit from special bus routes: Aloha Stadium (for swap meets, football games, carnivals); Magic Island (for carnivals and fireworks); the North Shore (for surfing competitions); the State Capitol, Civic Fairgrounds, and Honolulu Hale (for special events and rallies); and Waikiki (for parades, fireworks, and block parties). 5. Start an electric car sharing service. Honolulu could start an electric car sharing service so that legal drivers could rent a car by the hour, including car insurance, within urban areas like Downtown Honolulu and Waikiki. Instead of driving a car and paying for gas and parking, people could rent a car for 1-3 hours and return it to be recharged when they are done. Companies like Zipcar.com and cities like San Francisco (citycarshare.org), Philadelphia (phillycarshare.org), and Boulder (carshare.org) are already doing it. Why not Hawaii? If nothing else, the tax that funds rail transit could be allowed to expire, so that taxpayers can choose how to spend their money. Do you think Honolulu Rail Transit can be built, on schedule and on budget? Will you ride it? What would make you give up your car? Last week, we celebrated National Library Week. 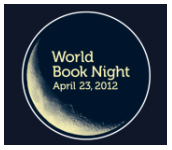 This week, on April 23, 50,000 book-loving volunteers across America, the United Kingdom, and Ireland will celebrate World Book Night. Their goal is to share 30 selected books in their community, giving books to people who don’t read much or who don’t have easy access to books. The books have been donated by publishers, bookstores, libraries, authors, printers, and paper companies, while volunteers donate their time and enthusiasm. It’s also World Book and Copyright Day, honoring the deaths of Shakespeare, Cervantes, and Inca Garcilaso on April 23, 1616, hosted by the United Nations Educational, Scientific, and Cultural Organization (UNESCO). The celebration was inspired by Saint George’s Day in Catalonia, when a rose was given as a gift for each book sold. But you don’t need to be a World Book Day participant or World Book Night volunteer to share the books you love. Why not share one of your favorite books with a friend or neighbor? Or sign up with a free site that let’s you swap books with other readers, like BookIns.com, BookMooch.com, and PaperBackSwap.com. Then there’s BookCrossing.com, a community of book lovers who add a BookCrossing label to their books, set them free, and find out where in the world the books end up. What are your favorite books? What books can you share today? Hawaii ranks #1 in electric energy costs, ranging from 33-44¢ per kWh (the national average is 11-12¢ per kWh), according to the U.S. Energy Information Administration. But the state wants to achieve 70% clean energy usage by 2030, and in 2010, became the first state to require solar water heaters in new homes. Today, Hawaii ranks second in the nation for cumulative installed photovoltaic per capita, according to a 2010 U.S. Solar Market Trends report; and ranks first in the nation for investment in energy savings performance contracting (ESPC) for public buildings per capita, spending over $150 million to date, according to the Energy Services Coalition. It’s not just homes, businesses, and government buildings; solar energy is in our public schools too. Recently, the Hawaii Department of Education has taken advantage of power purchase agreements, meaning that there are no upfront costs to install solar photovoltaic power systems in 19 public schools on Oahu and Kauai. The Aiea High School project alone could save the DOE as much as $150,000 in electrical costs over the next 20 years, according to Hawaii Pacific Solar. And 33 other Hawaii public schools have already installed solar energy in partnership with Hawaiian Electric’s Sun Power for Schools program. But in the rush to save money on electrical costs and save the environment with clean energy, we’re filling our rooftops with solar panels – and giving up the opportunity to use our rooftops for gardens. This year, Honolulu will have its first urban rooftop farm. Installed by FarmRoof and planted on a 38,000 square rooftop above AutoMart in Kaka‘ako, the rooftop farm will grow organic crops such as heirloom kale, arugula, and mustard seeds. The FarmRoof system uses 90% less water than conventional farming, can be powered by a 9-volt battery, and can yield it’s first harvest in as little as three weeks. The farm will also realize a 20% energy savings, by insulating and cooling the building; and take advantage of rainwater, helping to prevent stormwater overflows. Hawaii imports almost 85% of its food, leaving us vulnerable to food shortages and high shipping costs. “If even 25 percent of the available flat rooftops in Kakaako, Honolulu and Waikiki had FarmRoofs installed, we could grow enough loose leaf lettuce to feed every man, woman and child in Hawaii, with Zero Food Miles,” claims FarmRoof founder Alan Joaquin. Are we rushing to take advantage of sun power, instead of considering earth power? Can we find a balance between clean energy and gardens? For most of human history, tyranny and oppression have been the norm; freedom is rare, relatively new, and not guaranteed for future generations. 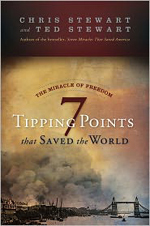 “The Miracle of Freedom: 7 Tipping Points That Saved the World” (2011) by author Chris Stewart and professor and former district court judge Ted Stewart examines some of the most important events in the history of the world that were “indispensable stepping-stones toward the miracle of expanded freedom and democracy in this day” (page v). Freedom is seen as a process, an evolution away from humankind’s instinctive rule by force. They identify five principles of freedom: self-government, fundamental rights, equality, commitment to justice, and commitment to the rule of law; as well as a sixth principle, economic freedom. The seven historical tipping points they choose to highlight are not individuals, inventions, or philosophies, but decisive events and decisions in the face of seemingly overwhelming odds. 1. The defeat of the Assyrians in their quest to destroy the Kingdom of Judah(701 BC). After conquering 46 walled cities and numerous villages in Judah, the Assyrians were on the verge of destroying Jerusalem when, because of plague or savvy negotiations, the Assyrian King Sennacherib recalled his army. Though eventually defeated, the Jewish community and faith remained intact and later gave rise to Christianity and Islam. 2. The victory of the Greeks over the Persians at Thermopylae and Salamis(480 BC). Against a massive Persian army, King Leonidas and his men made their last stand at the Thermopylae Pass; and Themistocles routed the Persian navy in the Gulf of Malis, aided by storms, and later at Salamis. The Greeks went on to establish the concepts of individual rights, personal liberty, and self-government. 3. Roman Emperor Constantine’s conversion to Christianity (AD 312). Putting his faith in an omen, a symbol of Christ, and a sacred vow, Constantine defeated a rival emperor at the Milvian Bridge and converted to Christianity. The spread of Christianity led to the growth of capitalism, an emphasis on reason and logic, the university system, charitable work, the sciences, literacy, the rule of law, challenges to slavery, and the sanctity of human life and marriage. 4. The defeat of the armies of Islam at Poitiers (AD 732). After conquering the Iberian Peninsula, the battle-hardened Arab armies faced fragmented French kingdoms when they met Charles Martel, the grandfather of Charlemagne, at a little-known battle at Poitiers. The Arab armies retreated after the death of their great general Abd al-Rahman, paving the way for Charlemagne’s renaissance and the forging of a common European identity. 5. The failure of the Mongols in their effort to conquer Europe (AD 1241). Just emerging from the Dark Ages, Europe faced the brutal Mongol horde – until the death of the Great Khan Ogodei recalled the Mongol armies for a khuriltai (election), allowing the embryonic ideas of individual freedom and representative government to grow into the Age of Reason. 6. The discovery of the New World (1492). At a time when the Christian Church was corrupt and Europe was exhausted by wars, when learning was in decline, lawlessness was on the rise, and the Inquisition had started, Christopher Columbus’ “discovery” of the New World led to an influx of wealth, economic vitality, and a renewed sense of optimism in Europe, paving the way for the Reformation and the Industrial Revolution. 7. The Battle of Britain in World War II (1940). During the rise of the Reich under Adolf Hitler, in the midst of strong anti-war fervor in Britain and a desperate Royal Air Force (RAF), the mistaken German bombing of a London neighborhood led to a last-ditch RAF defense effort in the first battle waged entirely by air forces. The Germans and turned their attention to the Soviet Union, prolonging the war until the Americans were roused by the Japanese attack on Pearl Harbor. Hitler was prevented from ruling all of Europe. “The Miracle of Freedom” is both celebratory and sobering, with descriptive, dramatic, engaging historical narrative of figures great and small. The book makes history interesting, posing “what if” scenarios. There is an unapologetic “American Exceptionalism,” pro-Christian, and Euro-centric slant. “Freedom exists because Christian Europe created an environment where an incredibly rare combination of values – commitment to reason, personal accountability, individual freedom, equality, rule of law, the right of self-government – provided a philosophical nursery that allowed these ideas to take root and then to flourish” (pages 279-280). The most thought-provoking assertion is that Westerners see a conflict between liberty and tyranny, while Muslims see a conflict between tyranny and justice (page 146). The most controversial tipping point, in my opinion, is the “discovery” of the New World; the authors make no moral judgments about the colonization and exploitation of the land, natural resources, and peoples of the New World. Last April, Kanu Hawai’i hosted a one-month “Live Aloha in Your Neighborhood” campaign, asking people across the islands to begin the process of building stronger communities, one block at a time, drawing on our culture of aloha. They asked people to start with one action: Reach out to people “3 doors down” in both directions from the place you live, and get together in a backyard, garage, building lobby, local coffee shop, or other place within walking distance. Only 57 people have taken up the challenge. I don’t know whether Kanu Hawaii is going to continue the “Live Aloha” challenge this year. But whether you make a pledge on their website or just make a simple decision, we can all make small choices to strengthen our communities. * Be aware of our neighbors. Creating relationships with our neighbors provides a support system and community security that comes from caring about each other’s needs. * Take care of our neighborhoods. As we look out for each other, it becomes easier to work together and build sustainable and environmentally friendly communities. * Prepare our community together. Resilient and vibrant, our neighborhoods become the foundations of thriving local economies no longer dependent on trans-Pacific oil and food imports. Another company that challenges us to “Live Pure Aloha” is Uncle Clay’s House of Pure Aloha, a Hawaiian treat shop in the Aina Haina Shopping Center that combines business with a social mission. Living the “Pure Aloha Way” embraces the core value of pure love, inner peace, self-discovery, truly believing, humility, and the continual pursuit of perfection. For inspirational stories about aloha around the world, check out the 20th Annual Celebration of the Arts Festival on Maui this weekend, hosted at the Ritz-Carlton Kapalua. On Saturday, April 7, an international panel called “Aloha Lives in Distant Lands” will discuss how the concept of “aloha” is practiced in Tibet, Africa, Samoa, Native America, and Hawaii. If you attend the Festival, please come back and tell us about it! Let’s all find small ways to “Live Aloha” wherever we are! You are currently browsing the Better Hawaii weblog archives for April 2012.